I received the product in the mail via UPS. After I opened the packaging box, and unsealed the plastic that it was covered, I have noticed a dent on the edge top of the can. I thought at first it was just a sun reflection, but when I felt it, it is positive that it was a dent. So I am not sure if it's whether the shipment that causes the dent or was it through the manufacturer when they sent the trash can. 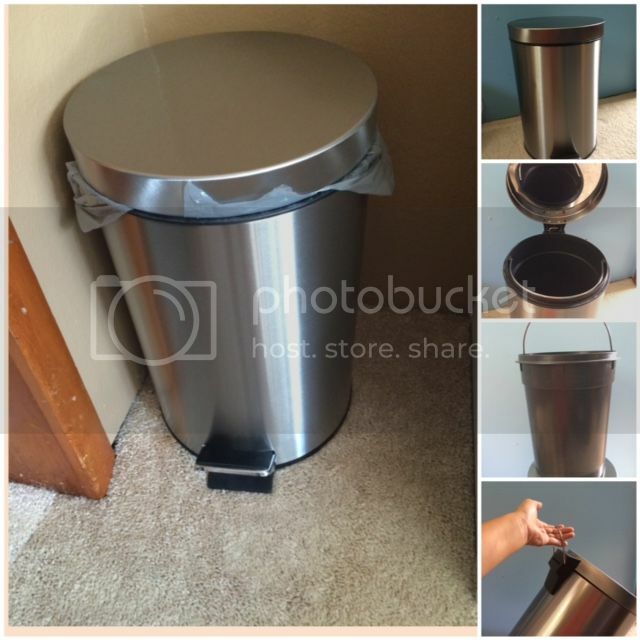 · I like the stainless steel trash can, it opens right away when you step on the pedal that I never have a problem, though I have noticed that it takes a while to open [you have to make sure you stepped on it hard] if you put a plastic in it. I did so it would be easy to hold the garbage right away. · I like the bucket style of the inner container. Very lightweight and it has also a metal handle to remove it easily. I choose to put plastic as I mentioned the reason in the first part. · I also like the handle located on the back of the trash can, very clever way to pick up the whole trash can. The easiest way to pick up and move the trash can. · The lid covers/sealed pretty good. · The style is also good, stainless, round that I can easily clean up and can easily find a dirt that sticks. · I also like how it is covered that way, smells will keep at it. I used the trash can to dispose of my son's disposable diapers, so whenever there is a pooped diaper sometimes it wrecks if there isn't a lid. I have this product for a week now and so far so good. I have no complaints or find/sees any problem with the trash can. I love stainless trash cans. In fact, I use some at my place :) The item looks presentable. wow! this is more durable than the plastic ones we have here. The disadvantage of this product is 'hindi mo pwedeng iwanan sa labas ng house'. Baka manakaw. I love a bin that looks so modern and sleek. This is perfect! I want to have that in my summer babe's room Mommy N. It looks very nice and durable.